Desford is on the southern edge of the Leicestershire coalfield, about six miles west of Leicester. A licence for dissenting worship was issued in 1672. In 1676 five nonconformists were recorded. In 1706 there were said to be three families of Presbyterians and four of ‘Anabaptists’ living in the village. The Presbyterians had a meeting house, although they were said to only use it once a month, on Friday. By 1709, the number of Presbyterian families had doubled, although meetings in the village were no more frequent. Their ‘teacher’ was a Mr Matthew, and numbers attending were ‘Inconsiderable & Uncertain’. Over the next 50 years, six other houses were registered for Protestant worship: the houses of Thomas Gardner and William Sutton in 1715, Henry Aslin’s house in 1716, Jonathan Johnson senior’s house in 1731, the house of Josiah Grudgens in 1739, and Sarah Dakin’s house in 1761, the latter probably for Presbyterian worship. By the 19th century there may always have been two chapels, but their denominations appear to have been fluid, and from this distance of time, somewhat confusing. Rather than recounting a potted history of each denomination, this account will therefore be arranged by date. In 1829 a congregation of about 15 Independents met for worship in the village, as did a larger group of 80 Particular Baptists. At least one of these groups had a purpose-built chapel, which had been erected in 1804 and by 1851 was in use by the Particular Baptists. Two chapels were also noted in 1846, but were now described as belonging to the Wesleyans and an Independent congregation. It is possible this information was inaccurate or misinformed, as neither denomination made a return to the 1851 religious census, and no other sources have been found which mention a Wesleyan congregation in the village. 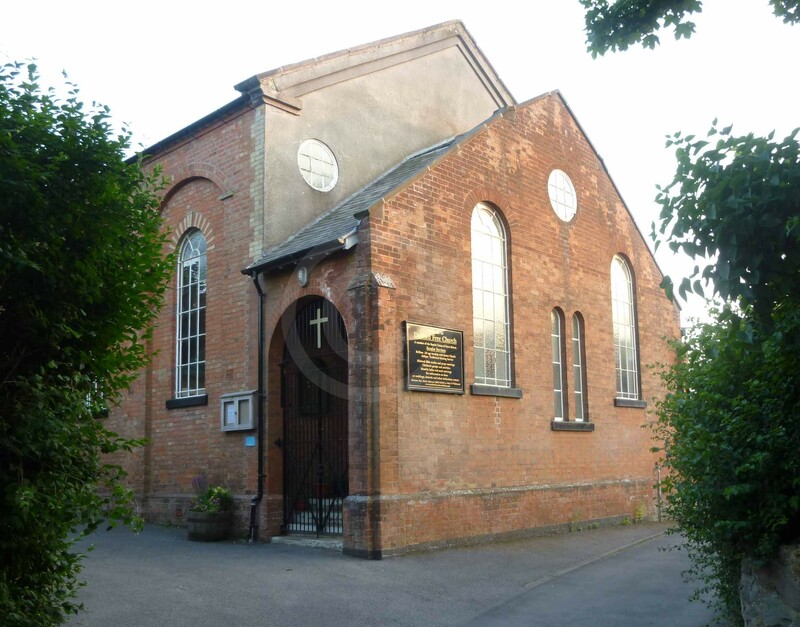 The two congregations which provided returns to the 1851 religious census were said to be Particular Baptist, whose chapel had been built in about 1804, as noted above, and Primitive Methodist, with a chapel said to have been built in about 1840. The Particular Baptist chapel could accommodate 120 worshippers, and all seats were free. On 31 March 1851, there was just a single service, in the afternoon, attended by 19 people, which was said to be about half the usual attendance. There was no Sunday school. The only service that day in the Primitive Methodist chapel was in the afternoon, and attended by 10 people which was also the average attendance. They also had no Sunday School. Steward John Kinton recorded that ‘This sect is now at a very low ebb in this parish’. This chapel, which also had 120 seats, was used during the week as a schoolroom, unconnected to the Methodists. By 1855, the Primitive Methodists were still noted as meeting in the village, but the Baptist congregation was now listed as being General Baptists. By 1863 it was said that the The ‘General and Particular Baptists and the Primitive Methodists’ had chapels in the village in 1863, but the wording is ambiguous, and it is not clear whether the ‘General and Particular Baptists’ met together or separately in the same building, or if they each had a chapel. In 1881, there was said to be a Particular Baptist chapel and also a Calvinist chapel, with no specific mention of Primitive Methodists. However, in 1895 the two chapels were described as General Baptist and Calvinist. The Ordnance Survey maps of 1886and 1903 show a General Baptist chapel in Chapel Lane, with another chapel of an unnamed denomination closer to the High Street. A ‘General Baptist’ chapel was built or rebuilt in 1904, to seat 300 people, but its location is not clear. This may be the chapel close to the High Street, which is labelled Baptist on the 1916 Ordnance Survey map, with the chapel in Chapel Lane said to be Free Church. By the 1930 revision, only the Free Church is shown. The present (2014) Free Church is tucked away down Chapel Lane, and is a member of the Baptist Union. The building appears to be late 18th- or early 19th-century, with date stones on an apparent extension bearing the year 1896.